The GY-HM890U delivers pristine HD images to solid state memory while streaming via Wi-Fi or a plug-in LTE modem. It features 4 channels of audio, dual memory card recording at up to 50 Mbps, an external HD-SDI pool feed input, and a full complement of fiber and multicore studio options. On your shoulder, its solid feel gives you the confidence that you are working with a camera you can count on - even in the most difficult shooting conditions. All of the controls you need are at your fingertips right where you'd expect them. Three CMOS sensors ensure that picture quality is second to none whether you are producing HD, SD or for the web - or all of the above! 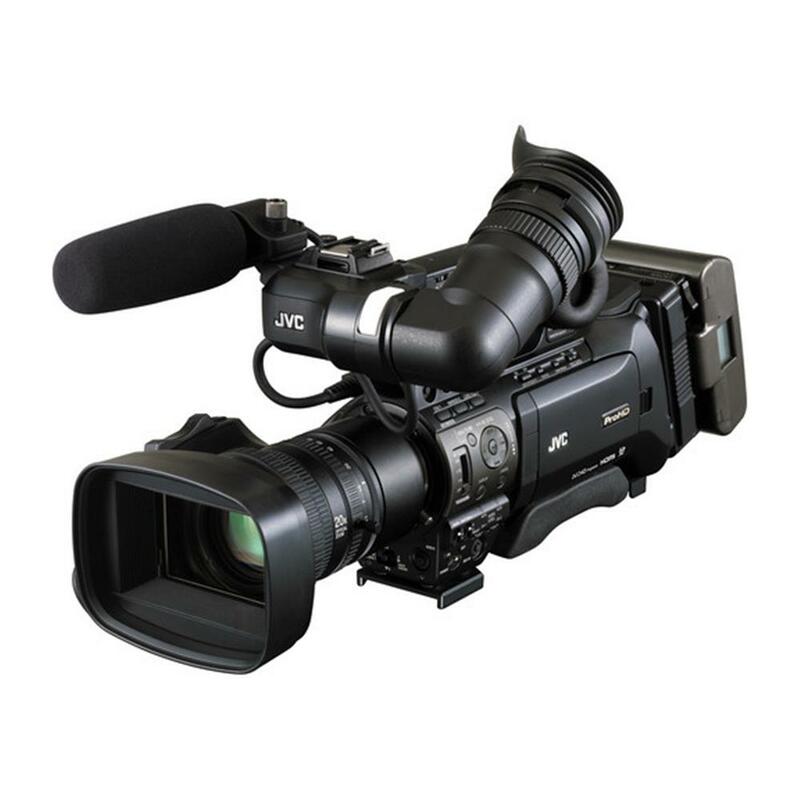 With JVC's Advanced Communications Technology, your content is delivered instantly to the studio and even to your viewers.With its unique modular design, the GY-HM890U is an ideal studio camera. 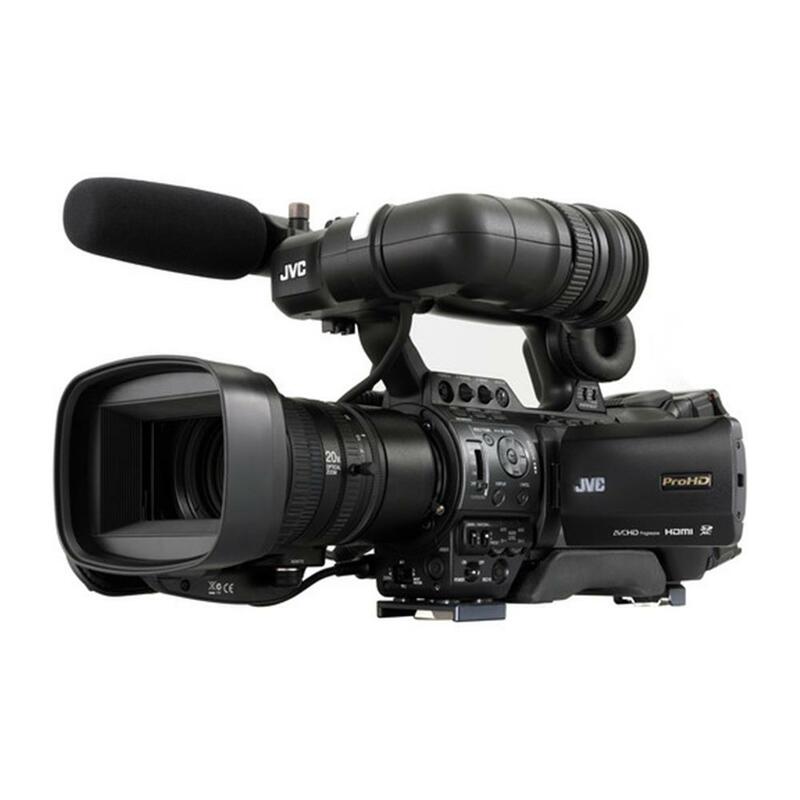 JVC offers a wide range of fiber and multicore options, with a dedicated sled and high resolution viewfinder. Round out the studio system with a pedestal and teleprompter and you'll have an affordable first rate studio system. The GY-HM890 is equipped with multi-pin interface that allows various modules to be attached to the unit without external cabling. The KA-M790 multi-core studio interface module offers a 26-pin interface compatible with cables from JVC and Sony to connect with a camera control unit (CCU.) Power, camera control, intercom, tally and a fully digital HD signal path are available through the RM-HP790 CCU. Other modules include the KA-F790 Remote Fiber Adapter and the KA-AS790 ASI Module. In a studio configuration, the GY-HM890 is easily fitted with the KA-790 sled, a sleek and functional housing that supports a studio viewfinder, teleprompter and large lens if desired. JVC's VF-HP790G is an 8.4-inch high resolution LCD viewfinder with a digital interface to the camera. 3CMOS At the heart of the GY-HM890 are three 1/3-inch 2.07 effective-megapixel CMOS sensors, each capable of capturing full HD 1920 x 1080 resolution images. Featuring 12 bit read-out, an excellent sensitivity of F11 (60Hz) / F12 (50Hz) and a remarkable signal-to-noise ratio, the devices provide superior precision and color reproduction with minimal aberration. For improved CMOS sensor performance, flash-band compensation is also supported. The GY-HM890 is equipped with a newly-developed Fujinon wide-angle 20x zoom lens offering one of the highest magnifications in the industry. For superior low-light performance and assured brightness at the tele end, the lens offers F1.6-3.0, a focal range of 29mm - 580mm (35mm equivalent) and includes servo zoom, along with manual focus and iris rings. Optical image stabilizer and chromatic aberration correction are also built into this interchangeable 1/3-inch bayonet mount lens. The built-in Optical Image Stabilizer (OIS) helps to correct lateral and vertical movement of the camera, ensuring that pristine HD images remain sharp and stable. For studio rear control of this lens, use the HZ-HM600VZR Varizoom unit (Sold Separately) for focus, zoom and iris and VTR control. The HZ-ZS13U rear zoom control (Sold Separately) may also be used, but not the HZ-FM13U manual focus control (Sold Separately). For a wider angle of view, JVC offers the HM600WC8X72HU wide angle adapter (Sold Separately). For users who prefer a manual lens, JVC offers a wide range of Fujinon and Canon lenses and lens accessories compatible with this camera. The GY-HM890 produces outstanding images under a wide range of lighting conditions. Minimum illumination is less than 1 lux: 0.15lx (typical)* JVC's exclusive LoLux feature permits shooting in adverse lighting conditions. LoLux can be assigned to a USER button, and set in the menu to offer +30dB or +36dB of gain. A convenient gain switch provides default gain values of -6dB, 0dB, +9dB. These switch positions can be adjusted to various gain amounts from -6dB to +24dB. An ALC mode is also available to boost gain values from +6dB to +24dB. Standard sensitivity of the GY-HM890 is measured at F11@2,000 lux. FALCONBRID is JVC's high-speed processor for advanced video applications. Delivering tremendous processing power on a single chip, the on-board FALCONBRID engine processes large mounts of video data at exceptional speeds. Together with this technology, superior image quality has been realized with 2D DNR processing and compensation circuitry for wide dynamic range. The GY-HM890 utilizes dual codec FALCONBRID processors that make it possible to record full HD to a memory card, and stream live video to the web simultaneously. The camera is also capable of recording to two memory cards in two resolutions?one in full HD and one in SD, or to a smaller web-friendly file. Depending on connection speed, the smaller files can often be transferred faster than real time for delivery to websites or file-sharing services. The GY-HM890 is also equipped with the H.264 Extreme High Quality (XHQ) 50Mbps mode for virtually lossless compression?even when recording fast moving objects. MPEG-4 AVC/H.264 offers approximately twice the compression efficiency of MPEG2. Its superior motion prediction ensures a smooth and detailed picture with virtually no block noise in rapid action sequences. The XHQ mode is available when recording 1920 x 1080 at 60p,60i,30p and 24p. The GY-HM890 further provides the H.264 Ultra High Quality (UHQ) 35Mbps recording mode, again offering superior image quality but with smaller file sizes. Record HD or SD footage directly in ready-to-edit QuickTime MOV files, the native file format of Apple's Final Cut Pro. Native file recording ensures your footage is ready to edit the moment it's shot, resulting in a more efficient workflow and no loss of image quality. For direct editing in other major NLE systems such as Avid Media Composer, Adobe Premiere and Grass Valley Edius Pro, it is also possible to record XDCAM EX compatible MP4 files for a likewise seamless native workflow. Dual SDHC/SDXC card slots make the GY-HM890 a truly versatile camcorder, offering such benefits as simultaneous recording and relay recording with reliable and cost-effective media. In relay recording mode, you can shoot continuously and seamlessly over multiple cards. When one card is full, the camcorder switches seamlessly and automatically to the other card. And because cards are hot swappable, there is in effect no limit to the continuous shooting time in any mode, even with lower capacity cards. It is possible to start editing footage from one card while still shooting to the other. With simultaneous recording, you can easily create backup or duplicate files as you shoot without the need for any external equipment - either for a client copy or simply for peace of mind. Additionally, while the Rec trigger is used to pause and unpause recording on one card, the other card can act as a continuous backup that overrides the pause function. The GY-HM890 is equipped with a USB 2.0 host connector that supports an optional wired or wireless (Wi-Fi) network adapter, or a broadband 3G/4G USB Stick. Through connection to a LAN, WAN or internet, various wireless communications functions are available. As the GY-HM890 records live footage, metadata optimized for news production is added to the files and is carried throughout the entire workflow from NLE's to playout servers. Metadata may include TITLE (2 data fields), CREATOR, and DESCRIPTION (up to 2047 characters) as well as date, time and location from the camera's built-in GPS receiver. You can download a metadata settings file (XML format) from a remote FTP server and store metadata in the GY-HM890 for recording onto video clips in the MXF format. Once stored in the camera, metadata is then recorded into the MXF video clips, and will stay with the clips through postproduction, playout and archiving. The GY-HM890 outputs a transport stream with TCP or UDP protocol to a decoder or computer with a fixed IP address at the receiving facility. Latency is minimal (usually under 2 seconds with UDP transmission.) Image quality is dependent on the speed/mode selected. With a good 4G, Wi-Fi, or wired connection, additional error correction may not be necessary making this the easiest and most economical streaming solution. Streams may also be "pulled" from the camera using Real-time Transport Protocol (RTP) and Real-time Streaming Protocol (RTSP). JVC's advanced streaming technology, powered by Zixi, utilizes content-aware error correction algorithms to compensate for packet loss common with mobile internet connections. In this mode, the decoder performs a dynamic assessment of the link capacity (link monitoring) and signals the camera to adjust bandwith and, if necessary, resend packets. The advanced error correction is able to compensate for up to 30% packet loss assuring a reliable stream even under adverse conditions. A Zixi-licensed decoder or server is required at the receiving end. Single camera point-to-point streaming to a single decoder delivers excellent results. For facilities with multiple cameras, JVC has made available the ProHD Broadcaster, the centerpiece for high quality IP video over the internet. Broadcaster is available as a physical server or cloud-based solution, and receives streams from JVC's streaming ProHD cameras and delivers those streams to various decoders and content delivery (CDN) ingest points. Broadcaster includes a wide array of video processing features, including transcoding, time shifting, VoD playout, recording functionality and stream switching. Whether phyically located on premises or in the cloud, Broadcaster offers a friendly web interface that simplifies management of multiple sources and stream destinations while providing advanced content-aware correction compatible with Zixi-enabled JVC cameras. When directly connected to an LTE modem or Wi-Fi hotspot, the GY-HM890 provides active feedback to the camera operator with indications in the viewfinder (and LCD screen) about the status of the stream and LTE (or Wi-Fi) connection. When the camera is switched to the playback mode, a clip viewer appears on the large LCD monitor and in the VF. (This signal may also be output through the HD/SD SDI connector.) Clips are identified by time code and with a user defined filename with numeric increments. Detailed information is displayed about each clip including recording format, resolution, and time code start/stop, user bits, and creation date/time. Clips can be protected from accidental deletion or deleted if no longer needed. Damaged clips (due to improper eject, etc.) may be repaired with the "restore file" function. Though no special formatting is required, memory cards can be re-initialized in the GY-HM890 to an empty state even while the other card is recording. The Quick Review function is available in the record-pause mode and allows the videographer to play back the first 5 seconds or the last 5 seconds of each clip, or the entire clip. After playback, the last image is retained (freeze) until the menu is reactivated. If during Quick Review, the record trigger is pressed, playback stops and recording begins immediately.